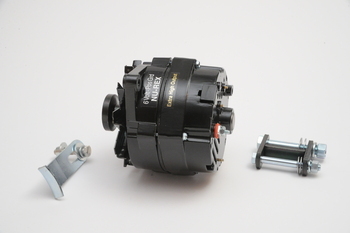 This 6 volt (60AMP) alternator is another Nu-Rex original design and is the finest 6 volt alternator available. Pioneered in 1996 and specifically developed for the Model A Fords. This assembly is built using all new components (no used parts). Featuring: 3:1 Max-R pulley, NEW special forward and rearward adjustment bracket (great for modified or odd fitting water pump pulleys and crank pulleys), belt tensioner and finished in Model A black paint. Features (60 AMP) output with special low RPM charge capabilities and one wire configuration. Can specifically power 2 halogen headlamp bulbs (20 AMPS) and simultaneously charge the battery at very low RPM. Great for parade cars or high current demand cars. This is a genuine Nu-Rex product.